Where is the Astrodome's Missing Time Capsule? 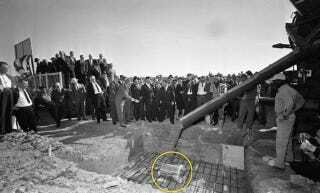 When the Astrodome was built in 1963, Houstonians did what all sensible, red-blooded Americans do whenever they break ground on a new building: They buried a time capsule. Unfortunately for those of us here in the 2015, nobody can find it. According to the Houston Chronicle, even the bomb squad has been enlisted to help find the missing capsule. But searches with ground-penetrating radar have so far revealed nothing. The best guess for where it could be? Underneath a retaining wall behind home plate. The Astrodome used to be home to the Houston Astros, but the team moved to Minute Maid Park in 2000. Since then there have been dozens of proposals for what to do with the building, from using it for the 2012 Olympics (which went to London, of course) to renovating it for use as a general convention complex. At this point it seems more people are just content to tear the Astrodome down. But whether they tear it down or not, we’re holding out hope that they can find that damn capsule. Items from 20 countries, guys!